This image demonstrates that EcoHIV infects mouse brain microglial cells, a process that we believe is responsible for induction of cognitive impairment by EcoHIV in mice. The image was obtained by Dr. Boe-Hyun Kim in Volsky lab, The Icahn School of Medicine at Mount Sinai, New York. Brains are composed of different cell types and the image from microscopy shows what cells EcoHIV infects in a mixture of mouse brain cells in tissue culture. The colors label specific elements in the cell mixture: blue shows DNA found in all cells, red shows a specific protein CD11b that is found in microglia, the brain cell related to macrophages found in other tissues, and green shows a marker inserted in EcoHIV to make it easier to see. The only areas with green are also colored red that together make bright orange. This means that the only cells infected by green EcoHIV are red, that is microglia. 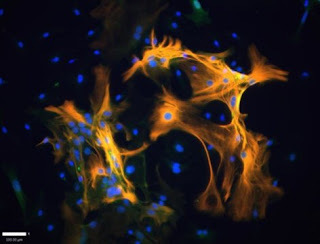 The cells that are not stained by red, either brain neurons or astrocytes, are not EcoHIV infected. This image thus demonstrates that EcoHIV infects mouse brain microglial cells, a process that we believe is responsible for induction of cognitive impairment by EcoHIV in mice. Drug combinations known as antiretroviral therapy have been very successful in suppressing the effects of HIV in infected people. To investigate the role of HIV in neurocognitive impairment, Gu and colleagues infected mice with a genetically engineered rodent version of HIV known as EcoHIV. They found that the mice's immune systems were able to suppress EcoHIV levels and EcoHIV complications; similar effects are seen in response to antiretroviral therapy in humans. As in humans, the mice nonetheless experienced learning and memory problems. The researchers found that, similarly to humans, the infected mice harbored dormant viral reserves in immune system T cells. However, despite the mice's robust immune systems, the virus also appeared at low levels in the brain, and actively replicating EcoHIV was found in macrophages. When mice lacking T cells were infected with EcoHIV, they still experienced cognitive problems, suggesting that the infected macrophages were enough to drive this impairment. These findings add to growing evidence that macrophages harboring active HIV may transport HIV to the brain, leading to cognitive problems in infected people. The researchers suggest that EcoHIV infection of mice could serve as a powerful and versatile research tool for further investigation of these effects and development of strategies to prevent them. "Cognitive impairment is a common problem in a wide variety of human conditions including diabetes, aging, and Alzheimer's Disease. Studies in the EcoHIV model of cognitive impairment may have broad implications for better understanding and treatment of these conditions as well." Yes! Finally someone writes about anti aging diet.